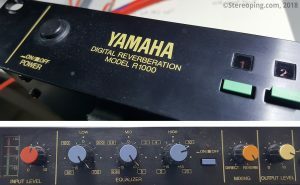 The Yamaha R1000 is a vintage 12bit (it’s said to be, not sure) digital reverb module. You can get them quite cheap as most often the pots are crackling (read more below). It gives the instant 80ies reverb flavour in 4 presets. The outstanding feature is it’s 4 band semi-parametric EQ. You can not adjust the q-factor but frequency and +/-15dp emphasizing in all 3 bands. The pots are high quality! After treating them with Caig DeOxit they run like new again without any noises. 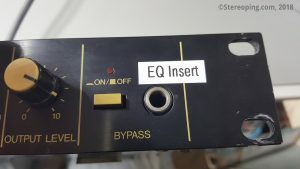 The EQ’s input is feeded by the reverb signal, allowing to push the reverb into different sonic directions and the EQ can be hard-bypassed by a pushbutton. Then there is a ‘Mixing’ pot to blend between 100% dry and (thanks god and Yamaha) 100% wet – which is great for the mod we want to do on this reverb later. I always missed the feature of muting the reverb for using the EQ alone. With some soldering we can archive that quite easily. The goal is to send any input signal through the EQ INSTEAD of the reverb. We use the input jack for the bypass footswitch, i think the feature of using a footswitch to toggle bypass ON/OFF is quite negligible. The bypass switch on the frontpanel will remain intact of course. Without having any cable plugged into the bypass jack, the R1000 is behaving exactly as it was before the mod. WITH the cable in the jack, the reverb is disconnected and the signal going into the cable is sent through the EQ instead. The R1000 is a 3 band semiparametric mono EQ then. The Bypass footswitch jack is mono and has got a switch. The ground contact on the side towards the frontpanel can remain untouched. 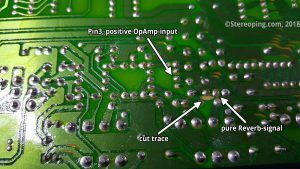 The traces to the other two contacts need to be cut on the PCB. 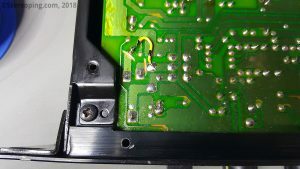 As the jack is placed between the bypass switch and the relais, we need to connect the traces on the PCB with a little cable, otherwise the bypass switch would not work anymore. Please see the picture to the right. Now we solder two audio cables to the contacts of the footswitch. The shield wires of both cables can be drilled together and soldered to the ground pin of the jack. 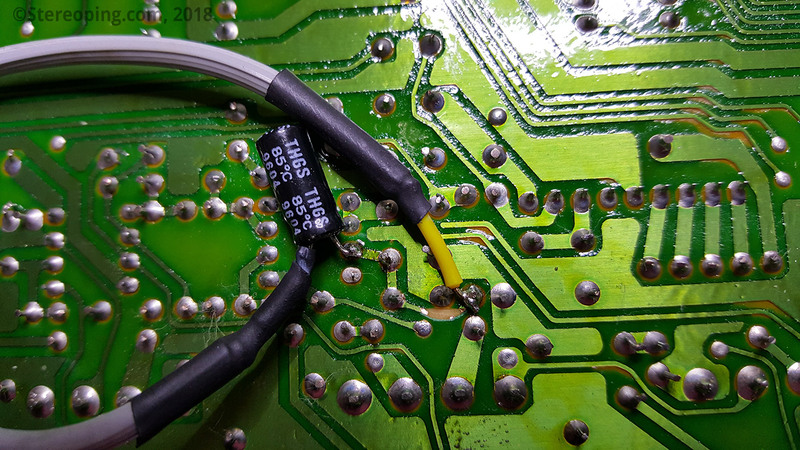 The red cable will be connected to the contact connected to the plug’s tip (if a plug is in the jack) and will be soldered to the EQ’s input later. The yellow cable leads to the jack’s switch contact and will be connected to the Reverb signal later. Now we need to find the point on the PCB where the reverb is sent into the EQ. 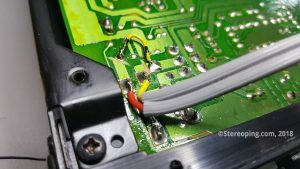 There we make another cut in a PCB’s trace to connect the cables from step 2. Both 4558 Dual-OpAmps near the EQ’s pots (.. in fact ALL 4558 OpAmps of course …) got their outputs on pin’s 1 and 7. 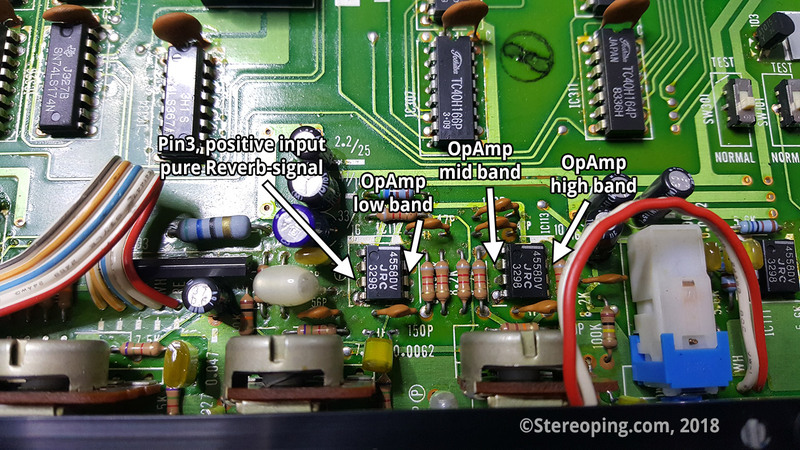 The 4 OpAmps are building up the 3 EQ bands and – yeah – a buffer stage for the reverb signal before the EQ (Output is connected to negative input). Our reverb signal can be found on pin 3 (positive Input) of the first OpAmp then. 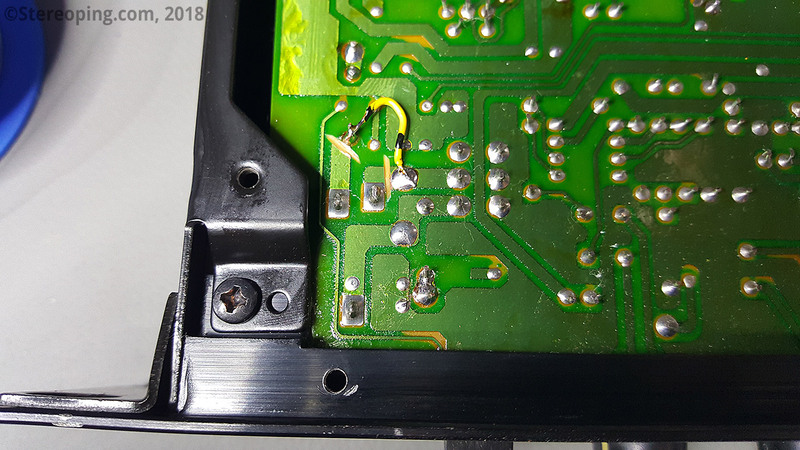 So we turn over the PCB and try to find pin 3 again. 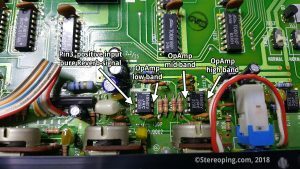 The Reverb signal is feeded into the input through a resistor, 2 caps are connecting the input to GND, most probably for taming HF noise. I’ve cut the trace directly after the resistor, the caps remain on the input side. The resistor-side of the cut trace supports the reverb signal, the other side is the EQ input where we now can feed any signal. The rest is easy. The red cable gets soldered to the positive OpAmp input. The yellow cable connects the reverb output with the jack’s switch pin. These ends of the audiocable are NOT connected to GND. I drilled the shield wires, soldered them together, cut the overstanding part away and added some heat-shrink tube to avoid unwanted contact to PCB parts. 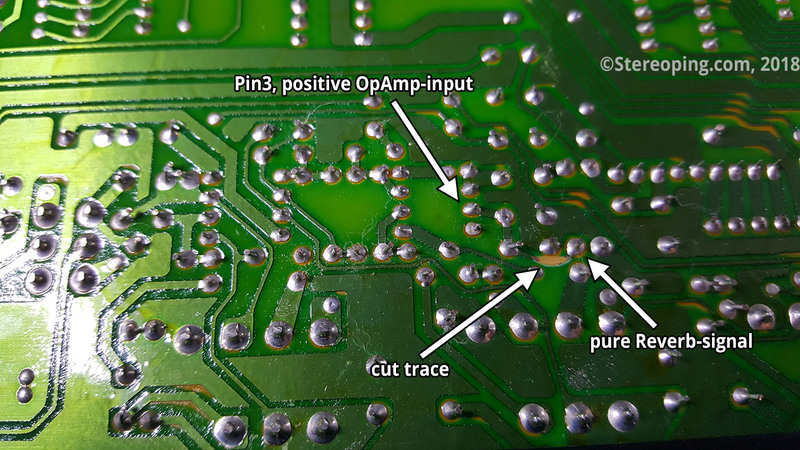 For safety issues (DC-decoupling) i soldered a 10µ cap between the input (from the jack) and the OpAmp’s input. That’s it. Now the EQ can be used separately, without reverb. Only little issue: the level feeded in on the EQ input jack appears a bit weaker on the R1000’s output than the level sent into the normal input jack. The Mixing-Pot does not know anything about the mod, means it works like before – 100% dry up to 100% wet. The using the R1000 as EQ the latter makes sense most i guess.